Since joining the Twins as the 73rd overall pick in 2016 draft, Miranda has been getting his feet wet all around the infield. This past season, the product of Puerto Rico basically split time between second base and third base with a couple appearances at shortstop mixed in. At the plate, Miranda provides an intriguing mix of power and contact skills. He actually had the lowest strikeout rate of any Midwest League hitter with at least 400 plate appearances last season. The really crazy thing is he struck out even less after he was promoted to Fort Myers, dropping from 11.62 K% to a 9.73 K%. And it’s not like he sacrifices power to do it, as Miranda finished fourth in the system in both doubles (27) and home runs (16). He was second to Alex Kirilloff in RBIs with 82 and even ranked second in the system by getting hit with 12 pitches. Miranda capped the season by making a huge impact in Fort Myers’ championship run, going 10-for-25 with three doubles and two home runs in the postseason. Alcala came to the Twins this July in the trade that sent Ryan Pressly to Houston. Prior to the deal, Alcala had a 3.29 ERA and 1.21 WHIP over 79 1/3 innings in the Astros’ system, but finished things out in Chattanooga pitching to a 5.85 ERA and 1.85 WHIP in 20 innings. So, not the best first impression. Armed with a fastball that’s been clocked as high as 102 mph, his slider doesn’t give batters much time to react either. That’s a late-breaking pitch ranging in the upper 80s. He seemed to learn how to put batters away last season, boosting his strikeout rate from 7.8 K/9 in 2017 to 9.4 K/9 last year. Alcala’s secondary offerings have some work to do in terms of consistency, which has put some uncertainty around his future role. Of his 24 outings on the season, 13 were for four innings or fewer. Even if the consistency with the full repertoire doesn’t develop, Alcala could make for a very exciting relief prospect. Wade was hitting .278/.388/.419 (.807 OPS) through July, then had a really tough final 25 games of the season that put a damper on his final year-end numbers. He gave right-handed pitchers all kinds of trouble, hitting .281/.391/.409 (.800 OPS), but had just a .563 OPS against same-sided pitching. Wade has seen a fair amount of time in center field over his pro career, but he seemed to settle into left field with some right field mixed in last season. He also played some first base back in college. Wade was added to the 40-man roster this offseason, and while he’s a bit buried on the current depth chart, there’s a chance we’ll see him at Target Field in 2019. Littell got knocked around in his first taste of the big leagues, posting a 6.20 ERA in 20 1/3 innings for the Twins, but he put together a strong season down on the farm. Only Lewis Thorpe racked up more strikeouts among Twins minor league pitchers. Littell boosted his K/9 rate a full strikeout from 8.1 in 2017 to 9.1 during his time in the minor leagues in 2018. Littell was the youngest player to surface with the Twins last season and faced batters who were older than him 96 percent of the time through the course of the year (629 of 655 plate appearances). He's never picked up much steam in prospect circles due to a relative lack of velocity, but Littell actually topped out at 96 mph during his time with the Twins, per Baseball Savant. It's rare for him to reach back with that kind of heat, he typically sits more like 92, but it appears he could be on the verge of unlocking something extra. Littell lacks a true plus secondary offering, but the curveball can really shine some days and he has enough of a changeup to keep hitters off balance. Wrap in solid command and you’ve got an excellent baseline package to continue to build upon. Speaking of the Ryan Pressly trade, Celestino was the other piece to the deal that was simply just too good for the Twins to turn down. A premiere athlete, this Dominican import is considered among the top defensive outfielders in the minor leagues. He’s regarded as having excellent instincts, good range and a strong arm. Celestino also uses his speed effectively on the basepaths. He’s 47-for-54 in stolen base attempts in his career, an 87 percent success rate. In addition to his athleticism, he also already has an idea of what he’s doing at the plate. He has a career .345 on-base percentage, a strikeout rate under 19 percent and a walk rate of over nine percent. Pretty solid stuff coming from a guy who’s faced older pitchers in nearly 95 percent of his plate appearances. Similar to Alcala, Celestino didn’t make the greatest first impression with the Twins. Luckily he had the opportunity to more than make up for it in the postseason. After posting a .656 OPS in 27 regular games with Elizabethton, Celestino reached base safely 12 times in five postseason games, going 7-for-19 with four walks and a hit-by-pitch. 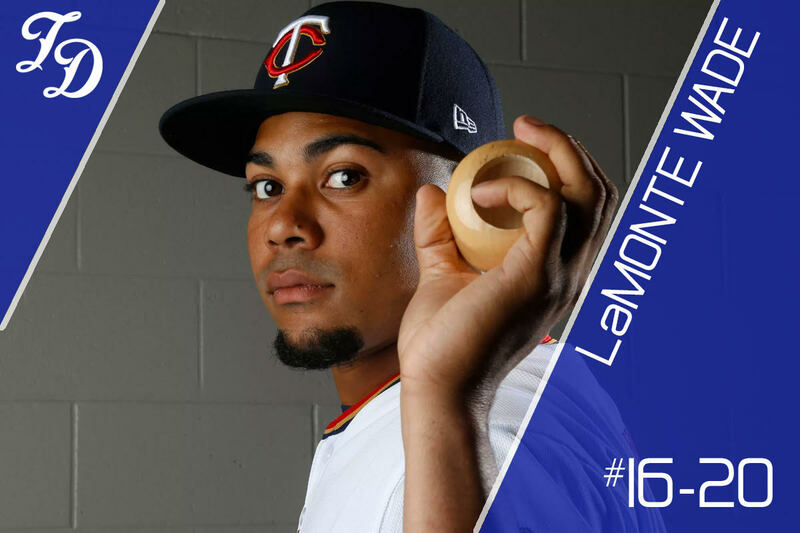 Get to know more about these five Minnesota Twins prospects and much more in the 2019 Minnesota Twins Prospect Handbook. It’s available in paperback or as an eBook. Just ignore what Celestino and Alcala did after they came to the Twins, I guess. 16 and 19. They have to be like they were before. They have to be. Just have to. 16 and 19. Put it in the book. I don’t think he ignored it, the stats with the Twins were mentioned quite prominently in both write-ups, along with the bigger picture. It’s the bigger picture which placed them in the top 20, which is quite a haul for a Rule 5 pick. Pressley may not be in the Santana category of Rule V picks, and there is a long way to go before these guys help, if they ever do--but it does make you realize the Rule V has its value. Four of these guys seem to have some tremendous upside, and the fifth, Wade, seems to have a pretty high floor. I think that Alcala is seriously underrated.Lots of similarities to his stuff with Graterol and similar command issues and similar bullpen concerns. Was the Astros' number 5 prospect according to fangraphs last July. I think you can honestly start considering Celestino and Alcala as high as fifth. This is a potential five-tool center fielder and a guy who throws triple-digit heat. The tools are elite. Collectively, I think we took more of a pessimistic view on both for this list. I tend to be a bit conservative in my rankings, so I'm comfortable with where they ended up, but I wouldn't bat an eye at a list that had either one comfortably inside the top 10. Celestino is supposed to develop power? He looks very slight but he's young I guess. If he's supposed to develop good power I'm in. This is the golden question. If you think the power will come, he's way too low on our list. If not, he might be a few spots too high, though legit center fielders don't grow on trees. He doesn't even turn 20 for another couple weeks, so trying to predict where he ends up physically is tough. So I think we've kind of hedged our bets in a way with this ranking, which I'm perfectly fine with. I'm a big fan of Miranda right now.He'd be my pick from this group to be in the top 10 next year. He's got some power now but I think there's more to come.His line at Ft Myers was hurt a lot by bad BABIP luck (and if you add his plate appearances from the playoffs, where he raked, his batting line improves quite a bit too).As mentioned in the write up his peripherals mostly held up there, and its rare to see that kind of strikeout rate combined with power. The system is deep, I get that. However, I'm not exactly thrilled that Pressly was traded for people who rank 19 and 16 in the system. Alcala is 11th and Celestino is 14th according to MLB.com.Baseball Prospectus has Celestino at 10th. I'm thrilled that 1 year of control for a relief pitcher netted this return. I always was a big believer in Littels stuff.I am surprised that with the success he has had that all he has is average stuff?The few times I watched him it looked like all his pitches had good movement. Granted he got hit hard when he was up with the Twins but I am surprised that with a good K9 his stuff is just average. I have always liked Wade and though I know he doesn't have great power I still think he is under-rated as his OBP is really good and a good eye at the plate translates well to MLB success.I get he might be seen as just a fourth outfielder but I think he will better than that in the end. Don't know much about Alcala or Cellestino but love their upside.I am concerned about Alcala's arm holding up and wondering if he can really harness his control. Always liked Miranda and I think he will have enough power to play third. I too am very positive on Alcala. Just out of curiosity, why do you consider him "high risk"? I can tell you his overall swinging strike rate was eight percent in September. Not terrible, but he wasn't facing the stiffest competition either. That will need to improve. Like a lot of guys in the high minors, I think there's still some work being done on how he can most effectively use his pitches. I definitely think he could benefit from some more time working against Triple-A hitters. I was a bit surprised they gave him those couple looks earlier in the season, but he was on the 40 man, so I guess why not? It will be fun to see where both end up after a year in our system. I am as hard as anyone on Falvine but I'm stoked about this trade. You have to give up quality to get quality. Hope Miranda can really break out, finish the season in Pensacola with Lewis and Kirilloff (if they are still there) and give the hot corner a better looking future. I liked the trade as well.To me we gave up one year of control for potentially 6 years of a pitcher that could be as good in relief as Pressley was or might even be a starter if the third pitch comes around.As a bonus we also got a4 to 5 tool center fielder who has been young for the level everywhere he has been so far and been successful so far. Granted you can never bank on prospects working out but the odds of the Twins replacing what they lost looks pretty good to me.Even if those prospects never work out they only lost one year of a reliever, but like I said I like our odds on this deal. I’m curious to see if FO decides to move Alcala to the bullpen, he has the potential of a frontline-ish starter, but he easily could fit in the Twins bullpen right now as a multi inning weapon like Josh Hader or Seranthony Dominguez. Probably better off remaining patient for now, but if the need arises it’s something to seriously consider (even more so than Romero). As for Wade, I thoroughly believe that he should break camp as the Twins 4th outfielder, but with Cave’s presence I really don’t see that happening. Meaning, I expect him to make his debut sometime before the all-star break. Hopefully, by that time there’s enough room on the roster for him to stay because I know for sure that his all-around abilities (especially on-base) could definitely help our team down the stretch of a likely back and forth battle between us and Cleveland for the central division. I'm' really high on Miranda. I think he's got tremendous power potential and 3B is his likely home. Alcala is 11th and Celestino is 14th according to MLB.com. Baseball Prospectus has Celestino at 10th. 2. He has to improve his command that is spotty. Is he moving up fast enough to take the Buxton spot if Byron does not reach his potential? I share your concern.I do not see Sano, even if he ups his game, staying at 3B for years.We need a fall back. I have watched and rooted for LaMonte for the last couple years, but I honestly feel he will make it when he is with another club.I think Cave is number 4 and they never really considered Wade.Then Kiriloff comes up and Wade continues to be pushed down.I am sorry about this, but maybe he is a good trade chip. I'm honestly OK when a team cashes in on a player like they did with Pressley. But bringing us to the present, that's why we should have been players in the huge RP FA market that this off season saw. The players were very much available to replace Pressley, but they didn't. That is a shame.